This week in the war, on 24 August 1943, the eight-day conference in Quebec City drew to a close. 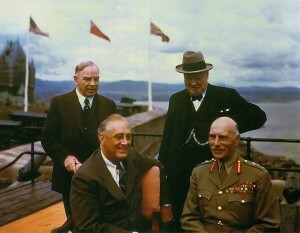 Churchill, Roosevelt and the Canadian Prime Minister were in attendance. Decisions made included giving priority to the British and US air offensives against German industry and coming up with a firm date for Operation Overlord, the D-Day invasion of Europe. The date chosen was 1 May 1944. Plans to invade the Italian mainland were also given the go-ahead. There was also agreement for closer collaboration in nuclear energy research, including the development of the atomic bomb. Afterwards, Churchill spent a few days fishing in the Province of Quebec. He caught a number of speckled trout before heading to the United States for further conversations with Roosevelt. This entry was posted in World War II and tagged Churchill, Earl of Athlone, Mackenzie King, Quebec Conference, Roosevelt. Bookmark the permalink.